Within 7 days of a fresh trim (suitable for a working barefoot horse) measure your horses width and length in mm. Width is taken at the widest point of the horses hoof (normally approximately ½ way or slightly over ½ way towards the heel from the toe). The length is taken to be the weight bearing surface of the hoof, do not include the frog/fleshy part of the heel. It is helpful to hold a straight edge across the back of the heel buttresses and the measure from the toe, bisecting the frog to the line you have formed. If you horse has very upright or under run heels, you will need to envisage where the heel should be if the hoof were more normal conformation, and take your measurements to that point, and not the actual termination of the horny heel. Once you have determined the width and length of the hooves you wish to boot, either Contact us or review the information below to ascertain which shape most closely describes them. From the information given, you will find recommendations for your horses hoof shape, but if your horse is between shapes, or has one hoof one shape and one the other, look at as many recommended hoof boots as possible and choose the hoof boots that most closely fit the hooves. You are aiming for a close as fit as possible, with both the width and length of the hooves fitiing into the measurements for the same size of boot. If the feet are very different and not a pair, try to choose boots that accommodate both hooves adequately, and not one that fits one hoof perfectly to the detriment of the other. If in any doubt Contact us for assistance! The round hoof, of hoof that is very slightly (approx 5mm) longer than it is wide is quite a common front hoof shape. Front feet are designed to bear 60-70% of the horses weight, which produces a slightly larger rounder bearing surface than hind feet which tend to be more concave and shovel shaped in appearance. The Wide fit Glove, Wide fit Back Country, Transition, and sometimes the Old Mac G2 are likely canditdates. The wider than long hoof is a much less common hoof shape in a well trimmed barefoot horse, most commonly being seen in horses just out of shoes or those being ‘pasture trimmed’ as opposed to a more performance orientated trim. It can also be seen in fully trantitioned Draught and TB horses. If the horse has symmetrical hooves with straight walls, the wide fit glove is often a good candidate. Horses just out of shoes with flare and asymmetry are often better suited to the Transition which will usually accommodate a greater range of shapes. This hoof shape is very common in well trimmed barefoot horses, and well catered for in hoof boots generally. Hoof boots to look at would include the Old Mac G2, the Easyboot Glove, the Back Country, Epic, Trail and Transition. The front feet of a navicular or lamanitic horse can often be very much long than wide, which can limit the boots available, once the measurements become more extreme, the old mac G2 becomes the best option when used with the inserts to take up the width. For example, a hoof width 129mm x 154mm length would need a size 9 G2 probably with inserts, even though the width is really better suited to a size 5. The only time this will not work successfully is a narrow chested pony or small horse as the boots will be too wide for the horse to cope with and will catch them on each other. The Transition can also fit a fairly narrow hoof so is also worth considering. Every hoof boot has its merits, but will not be able to perform to its full potential if it is the wrong size or incorrectly fitted. 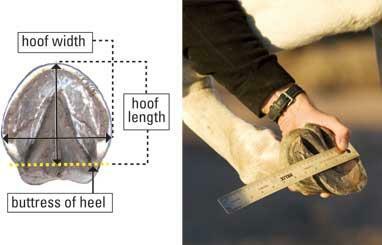 If you encounter problems, first recheck sizes (especially if they start to fail after a new trim) and then check the fit with regards to hoof angle, flare, heel bulb size etc. to make sure it really is the best one for your horses foot shape and size. If you are at all unsure as to suitability of hoof boots for your horse, please do Contact us for advice.